Last Saturday, my brother-in-law Blair attended an auction in his neighborhood. Unfortunately, he arrived late and most of the truly great pieces were gone, but he spied a set of speakers and a sub-woofer in the corner of the top floor ballroom. The owners, wanting to get rid of everything, quoted him a price of $35. The set, by Definitive, sold for about $2,700 new. Blair called Steve to get his opinion and Steve told him to just buy it. He said if the set didn’t work in their house, we’d buy it from them for what he paid. Because Blair had recently bought an even better set of speakers from a friend, he decided to sell us the Definitive set for the staggering sum of $35. We met in Kansas City last weekend and came home with our new speakers and sub-woofer. 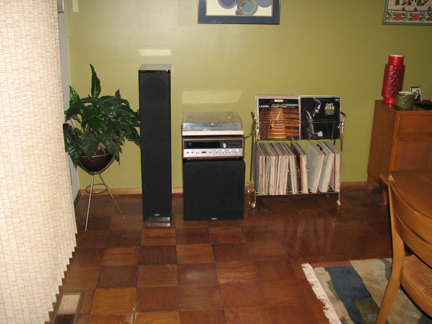 Steve originally wanted to remove the speakers that came with the house (and are inside specially-built cabinets) but he decided to set it up in the dining room. We had also inherited an old amp when we bought the house, and had a Pioneer turntable we weren’t using, so he set them up in the dining room. The amp isn’t great, but the speakers are amazing. The sound travels upstairs and fills the house. Steve also discovered he could hook up his iPhone and play his Pandora radio through the system. I prefer vinyl. I had put a record rack in the upstairs game room just to store my unplayable vinyl, but I brought it downstairs so we could move some albums near the new stereo for some upstairs music. This morning I started with a little Chet Atkins and have now moved on to some Eydie Gorme. I am loving this system! Well, Side A is almost done and I need to go downstairs and flip the record.